And down the rain fell. On and on, giving only brief respite. It started early on Friday, and by the end of practice on Saturday, it was still raining. The Brits, who were used to this sort of thing, had their own take on it. After all the rain, when all the teams had organized their wet-weather setups, it would be dry as a bone on Sunday. Sure enough, it was! 33 cars arrived for the weekend, and these were divided into two groups, practicing separately on both Friday and Saturday. The first group got a drying track for the first 30 minutes on Friday, but after that it poured for the rest of the day. On Saturday it was quite light initially, before battering down again for the rest of the day. It was during this first session on the Saturday that Bruno Giacomelli in his Junior Team/Polifac March-BMW set the fastest time in practice, and snared his sixth pole in seven F2 races. Joining him on the front row was American Eddie Cheever, the previous year’s winner. Both he and Project Four teammate Ingo Hoffmann had been trying very hard in the wet practice, both men twitching 100 yards down the track under acceleration. Both drivers in the finish almost missed out on the front places, Hoffmann’s tyres going off when he could have been fastest, and Cheever getting stuck in the bad weather. Beside Cheever on the second row was Alberto Colombo, who belied his reputation as F2’s “Wild Man” by producing the second fastest time in his group behind Cheever. He probably could have gone faster were it not for his slightly misguided decision to try slicks on Saturday afternoon as the track momentarily dried. His teammate Roberto Marazzi however, was be-devilled by bad luck. After his big crash at the previous round at Vallelunga, his car was still being repaired on Friday so he couldn’t try for a time. On Saturday, with the track at his driest, he went off at Nouveau Monde, and his car refused to restart. This cost him any chance to qualify. On the 3rd row sat Alex Ribeiro in his Jesus Saves March-Hart and Bernard de Dryver. Ribeiro’s time had been coming down as fast as Giacomelli’s, but with the track at its best he had to stop for fuel, and by the time he came back out it was raining again. De Dryver only used the first session to set a time in his Salisbury March, not even bothering to go out for the second session. His teammate Gianfranco Brancatelli missed the cut when his car suffered with engine problems and he never got a chance to set a time on the drying track. Marc Surer in the second Junior Team/Polifac March-BMW and Derek Daly in the first of the ICI Chevron-Harts lined up on the 4th row, with Manfred Winkelhock, in his first trip to Rouen, driving the third of the Junior Team/Polifac March-BMWs and Roberto Zunino in the works March-BMW on the 5th row. 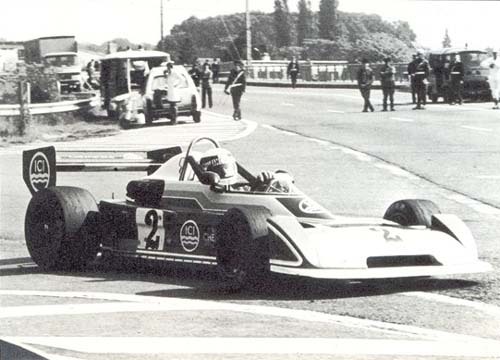 Jean-Pierre Jassaud, a winner previously at Rouen, lined up on the 6th row in the second ICI Chevron-Hart with Boy Hayje alongside in his F&S Chevron-Hart. Hayje almost didn’t make it to Rouen, only being informed about the race while still at home in Holland on the Friday morning! He rushed to the circuit, managed 8 laps on the Friday, and qualified well on Saturday on the drier track. The Italians, Elio de Angelis in the Chevron-Ferrari and Piercarlo Ghinzani in the Allegrini March, took up the 7th row of the grid. This was Ghinzani’s first visit to Rouen, so he did well to qualify in the difficult conditions. A new car, the Pentax Cameras-sponsored Nova-BMW/Matsuura 532 occupied 15th spot, driven by Japanese driver Kazuoshi Hoshino. Hoshino was having a lot of success in Japan, and his team, Heros Racing, decided it was time to see how he went in Europe. Brian Henton rounded out row 8 in his Toleman. 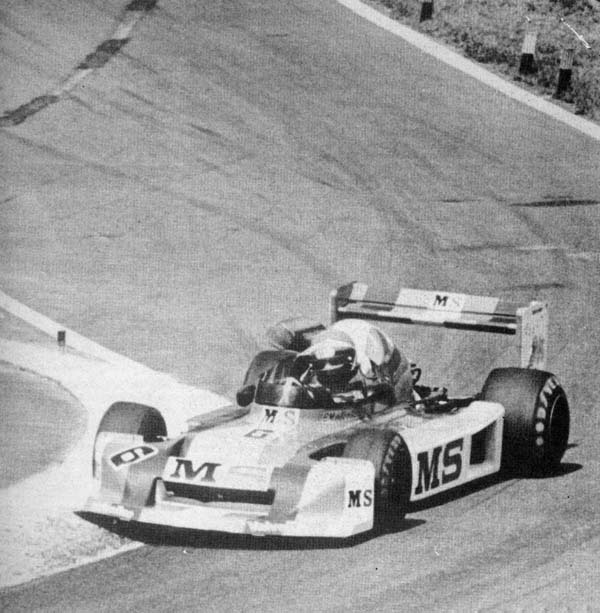 Eje Elgh qualified on the 9th row in his Chevron, but teammate Michel Leclerc was not so lucky, failing to qualify as he struggled with chronic oversteer. Axel Plankenhorn joined him on the 9th row in a Ralt-BMW on his Rouen debut. The two Sperry Univac March-BMWs of Jean-Pierre Jarier and Alain Couverc rounded out the field on row 10. Apart from the three already mentioned, another ten drivers would be spectators on the Sunday. Eddie Cheever blotted his copybook during the 30-minute warm-up. After showing such car control during the wet practice, he lost downforce following teammate Hoffmann and spun, badly damaging his March. Thankfully this was the Project Four training car, so he was able to use Hoffmann’s regular car for the race. Nevertheless, it was Cheever who got the best start at the green, Giacomelli, Colombo, Daly, Surer and Ribeiro following closely behind. The unfortunate Hoffmann failed to move at the start due to a slipping clutch, but he finally got underway after the entire field had passed him. Daly had got by Colombo to take third by the end of the lap, and the top 3 began to pull away. Meanwhile Winkelhock and Surer had a coming together when Winkelhock spun, hitting Surer’s front wheel hard. Surer was able to continue but with wobbly handling, while Winkelhock was forced to pit for a new nose cone. Hoshino had to do the same soon after. Giacomelli closed right up on Cheever, and after two tight laps, finally made it past as the two cars accelerated past the pits. Daly sat not far behind, keeping a watching brief. Surer meanwhile got past Ribeiro to take a lonely 4th place, ahead of Colombo, Zunino, Ghinzani, Hayje, Legh, Plankenhorn and Henton. Hoffmann had reached the top 10 by lap 10 as he charged through the field, while de Dryver and Jassaud were both early pit visitors, de Dryver with oil pressure problems, and Jassaud with a deflating tyre. 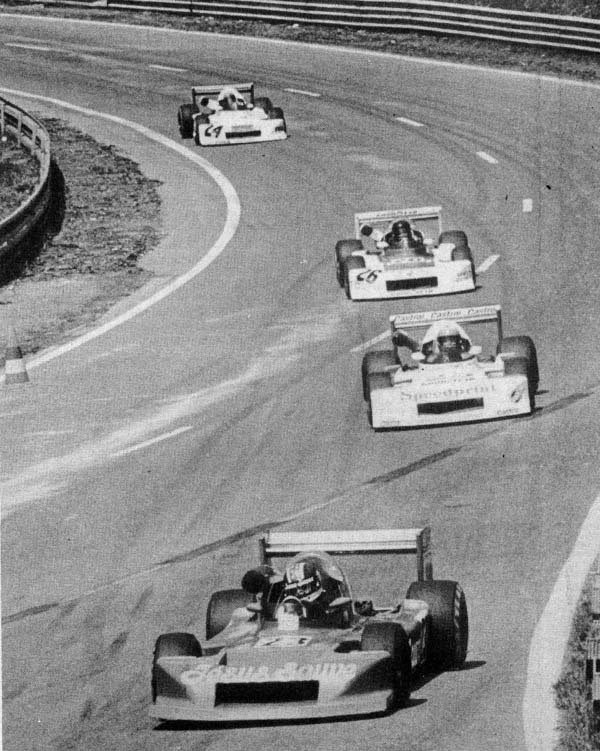 The front two were setting a searing pace, with Giacomelli just keeping Cheever at bay. But when Cheever started having trouble with 3rd gear on the 10th lap, Giacomelli could relax a bit. A good thing too, as his car was getting quite hot. All eyes were on Hoffmann by this point, as he went by both Elgh and Henton on the same lap, then took Zunino on lap 13, and was past Ribeiro and Colombo the next! He was now in 5th, and right behind Surer. On lap 20, he got by into 4th, an incredible drive. Lap 22 saw Ribeiro visit the pits with a tyre problem, while Henton closed right up on Colombo after overtaking Zunino. By lap 27 he was by, and eventually he shook him off. Hoffmann now closed right up on Daly in 3rd, while Ghinzani retired from 10th with no gears. On lap 31 Hoffmann was onto Daly’s tail, and the following lap made it past for 3rd, but shortly after his great drive ended when he made a mistake and spun off into the barriers, a great shame for all the spectators. So it looked like Giacomelli, Cheever and Daly would come home in that order, but then Daly’s car developed a misfire two laps later. It almost cut out at Nouveau Monde, cleared for a lap, and then died completely. Daly’s race was run, and Surer assumed 3rd place. Henton’s brave drive also came to an end, his clutch failing just four laps from the end while in 4th. Just before the end, Surer’s wheel which he had damaged in the earlier clash with Winkelhock, came loose and Surer showed great car control to not crash his March-BMW. But all was well. Not so for Winkelhock. Running ninth, he had an enormous accident a few laps from home, and was lucky to escape unhurt. Giacomelli duly reeled off the final laps to take a deserved win, well ahead of Cheever, who had done well considering his gearbox issues. Surer nursed his car home for 3rd, with Colombo and Zunino in 4th and 5th. Elgh was the first Chevron home in 6th despite gearbox problems and a loose rear wing, Hayje, Jarier, Plankenhorn and the delayed Ribeiro rounding out the top 10. It had not been a classic race, with Giacomelli winning comfortably, but everyone went home with fond memories of Hoffmann’s stirring drive through the field. 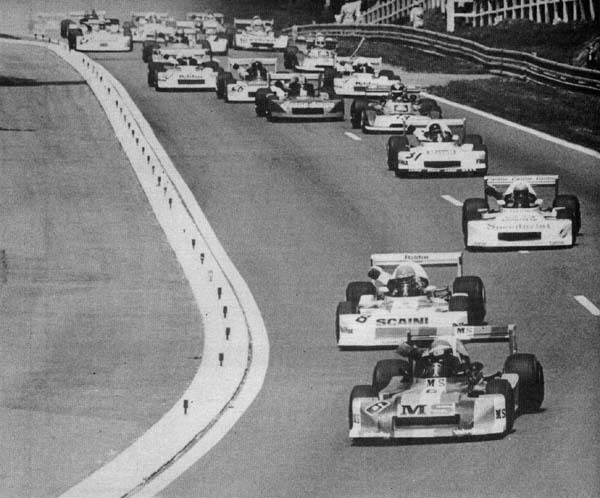 Giacomelli's win signalled the end of F2 racing at Rouen, as well as European Championship meetings in any class. The death of young Frenchman François Burdet in a Formula Renault race the previous year convinced the racing authorities that Rouen had become too dangerous for F2 racing. From now on, annual National F3 championship races would be the predominant class at Rouen.